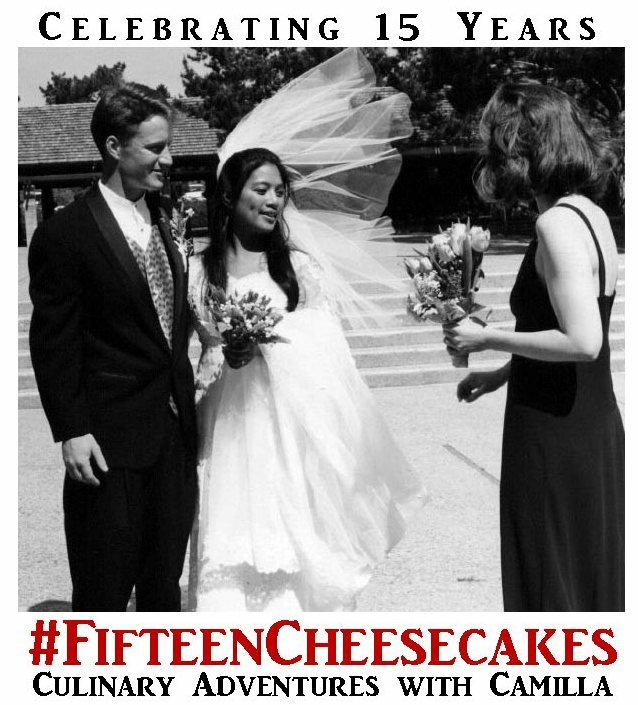 Today we are helping Camilla of Culinary Adventures with Camilla celebrate her 15th wedding anniversary with waaaayy more than #fifteencheesecakes. Here's what everyone brought to the cheesecake table, listed in alphabetical order. Enjoy! Cookies & Creme No-Bake Cheesecake by Hapa-tite! For #fifteencheesecakes I had my cheesecake recipe all picked out - I read through all of the tips and suggestions for baking a cheesecake in a water bath (which I have never done before) - I had my ingredients pulled out - I even had a Reynold's oven bag around the bottom of my cheesecake pan to prevent leaks into the cake (which I thought was such a great tip!) And then... then I couldn't find my roasting pan... anywhere. I have had a roasting pan for the past 10 plus years - I think I got it at some point after moving into our house in Hiram and don't use it often, but it's always worked great when needed. We moved late last October though - and somewhere between there and our new house it wandered off, or got donated, or trashed, or misplaced... I have no idea! But I did not discover this until I was ready to bake this cheesecake. So what was I to do?! I almost jumped in the car and made the trip to the store to get a new pan. But I decided to risk it and bake the cheesecake exactly as written, with no water bath. I put a pan of water under the cake instead - hoping that might help produce at least some of a similar effect. I'm pretty sure it did not work the same way, at all, as a water bath - but, irregardless of my issues with how I ended up baking this cheesecake, it was absolutely DELICIOUS! You can bet as soon as I locate my roasting pan, or buy a new one, I will be trying this again to see the difference with a water bath. This cheesecake has a perfect flavor; rich, decadent, just a light tanginess, super creamy, and with the strawberry sauce? Over the top. We all loved this recipe so much! I am so glad I finally gave baked cheese cake a try, and can't wait to do this one justice with the correct baking process! Generously butter the inside of a 10-inch springform pan. Wrap a double layer of heavy-duty aluminum foil tightly around the outside bottom and sides, crimping and pleating the foil to make it conform to the pan. This will help to prevent water seeping into the pan when you put it into the bain-marie. Position the baking rack in the center of the oven; preheat the oven to 300* Fahrenheit. In a large mixing bowl, using an electric mixer, beat the eggs with the sour cream until well blended. In a medium-sized bowl, beat the cream cheese with the butter until smooth and creamy. Add this to the egg-sour cream mixture and beat until smooth. Add the sugar, cornstarch, vanilla, lemon juice and lemon zest and beat thoroughly, about 2 minutes. Pour into the prepared springform pan and place in a roasting pan (or other pan) large enough to prevent the sides from touching. Place in the oven and carefully pour in enough very hot tap water to reach halfway up the sides of the springform pan. Bake for 2 hours, 15 minutes, or until the cake is very lightly colored and a knife inserted in the center emerges clean. Remove from the water bath and carefully peel the aluminum foil (or oven bag / slow cooker liner) from around the pan. Let stand at room temperature until completely cool, about 4 hours. Refrigerate, covered, until well chilled. For best flavor and texture, this cheesecake should be chilled overnight before serving. Note - please visit Katy's site linked above for comments / feedback to help ensure you get good results with this recipe if you're not familiar with baking cheesecakes and water baths (neither of which I'd done previously to making this recipe). Cut the greens off of the strawberries, rinse well. Dice the strawberries into small pieces (depending on how "chunky" you want your sauce - unless you plan to puree, then just quarter the strawberries), place berries in a medium saucepan over medium-low heat along with water, vinegar/lemon juice, and half the amount of sugar, stir, cover and cook for 10-15 minutes checking every few minutes to make sure it's not boiling off all the liquid. When the strawberries are soft and the sauce has thickened, taste and adjust sugar as desired. If you want a finely pureed consistency, allow the mixture to cool and then put it in a blender and puree until the desired consistency is reached. Note: Use within 2 - 3 days, or freeze any remaining sauce for later use. Looks delish Rebekah...congrats for moving out of your comfort zone. Any baking pan large enough to hold your cheesecake and the water will work for you waterbath in the future. Rebekah, thank you for joining the celebration! And your cheesecake looks delicious. I have half a flat of strawberries that I just got at the farmers' market last night! Thanks for sharing. Looks great! I am not a big fan of water baths and have found I get great results without one as well! You can never go wrong with the classic New York style. The strawberry puree is an awesome addition! Thank you Nichole - that strawberry sauce was the perfect complement to the creamy cheesecake! Oh...you can't go wrong with a classic cheesecake! Looks delish! Thank you Avril!! Mine is watering again thinking about it... I see more cheesecake in my future - especially after all these amazing recipes that were shared! So many to pick from, yumm!! Your cheesecake looks absolutely delicious, and looks great even without the water bath. I usually make no-bake cheesecakes, and have only made a baked version once. They are both good, but my family seems to prefer the no-bake versions the best. I love that you topped it with strawberry sauce too. I much prefer that to the usual cherry sauce.. I need to get into doing no bakes more often - they are such a smart way to enjoy creamy cheesecake; my hubby and son love cheesecake so I'm not sure why I never make them! Classic cheesecake is my favorite. So many options for the sauce. It looks delicious even without the water bath! That strawberry sauce is beautiful! You know, I've never actually had the classic cheesecake! Looks great.